PACKAGE THIS TITLE WITH OUR 2016 MLA SUPPLEMENT, Documenting Sources in MLA Style (package ISBN-13: 9781319084653). Get the most recent updates on MLA citation in a convenient, 40-page resource based on The MLA Handbook, 8th Edition, with plenty of models. Browse our catalog or contact your representative for a full listing of updated titles and packages, or to request a custom ISBN. 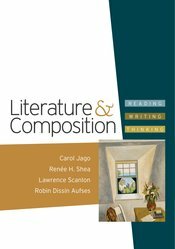 From Carol Jago and the authors of The Language of Composition comes the first textbook designed specifically for the AP* Literature and Composition course. Arranged thematically to foster critical thinking, Literature & Composition: Reading • Writing • Thinking offers a wide variety of classic and contemporary literature, plus all of the support students need to analyze it carefully and thoughtfully. The book is divided into two parts: the first part of the text teaches students the skills they need for success in an AP Literature course, and the second part is a collection of thematic chapters of literature with extensive apparatus and special features to help students read, analyze, and respond to literature at the college level. Only Literature & Composition has been built from the ground up to give AP students and teachers the materials and support they need to enjoy a successful and challenging AP Literature course. Use the navigation menu on the left to learn more about the selections and features in Literature & Composition: Reading • Writing • Thinking. *AP and Advanced Placement Program are registered trademarks of the College Entrance Examination Board, which was not involved in the publication of and does not endorse this product. "I think the approach that this text is taking is wonderful. I especially like the fact that there are numerous paired texts and an entire section devoted to synthesis. This is truly different from what you find in other textbooks, and I think it is a much better approach."